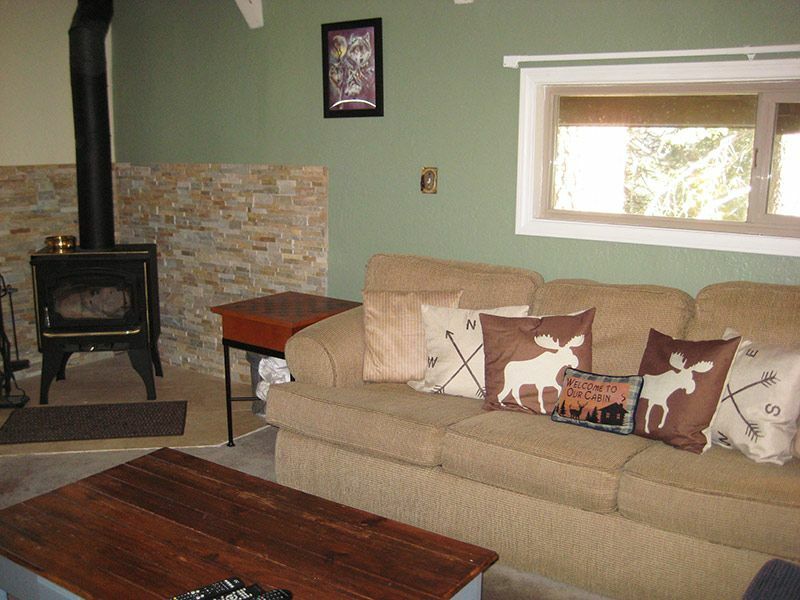 This is a cute vacation rental with wonderful tilework! It is a 2-bedroom and a loft unit with 2 bathrooms (bathrooms just remodeled) and a 3-star rating. It has a full kitchen, microwave, fireview woodburner, 43-inch flat screen TV in the living room, 27-inch box style TV in the 1st bedroom, 2 DVD players, stereo with a cd player and a hairdryer. The living room has a queen fold-out couch, the 1st bedroom has a newer California King size bed, the 2nd bedroom has bunkbeds where the bottom is a queen size bed and the top is a single bed and the loft has a newer queen size bed plus a foosball table. There are 18 stairs to reach this unit and it has 3 levels inside. The entry level has the living room, kitchen and dining room. Downstairs are both bedrooms and a bathroom. The loft is upstairs with another bathroom. This unit sleeps up to 9 people. Unit managed under Mammoth Lakes Business Tax Certificate 864. Generally, we love this property, and usually stay in another of the units (managed by someone else). Its nice, has a great hot tub, close to the gondola and the village, and has parking for a car or two. We stayed over a long weekend in this unit and had some issues. They did not leave us the key to the spa/hot tub, which was a big hassle. We called many times and never got a called back. Given, that was the weekend of the big snow storm, but still an issue. Juan, the manager, had to let us in but made it clear that was not ok/to be repeated. There were a few other small things that we called about that they never fixed or helped us out about. The place was nice, generally as advertised, although they left few towels. They were also relatively accommodating of us having to leave our car for a few days (we lost they key). However, they seemed to forget that we had told them we would be back on the Friday, and called us threatening to tow. They didn't, and it ultimately worked out, but we had cleared it with Juan in advance. Overall, I would not stay in this unit again as my first choice, as we had stated in other units in this property that were better organized and more comfortable. In the end however, we got to ski and enjoy our time.